From Juliet Stallwood’s The Icing on the Cake. Happy Halloween! 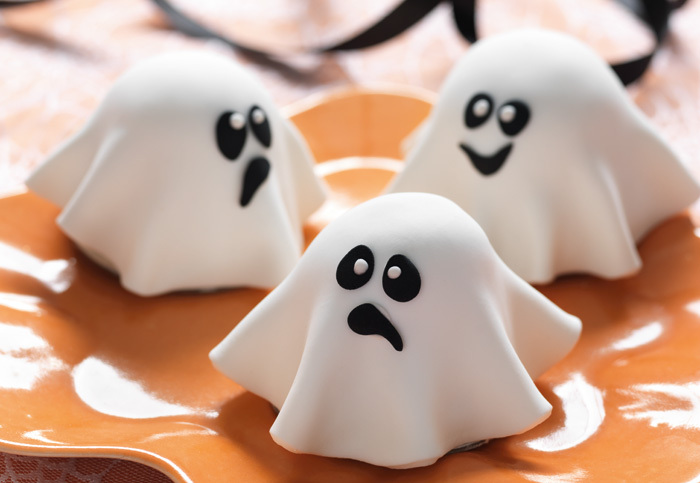 Try these cute ghost cupcakes, which are perfect for halloween parties and sure to be loved by adults and the kids. You can change the expressions of the ghosts by altering the position of the pupils and changing the shape of the mouths. 1. Preheat the oven to 180˚C/350˚F/Gas 4. Melt the butter and chocolate in a saucepan over a medium-low heat. Add the coffee extract to the pan and stir until combined, then pour the mixture into a large mixing bowl. 2. In a jug, lightly beat together the egg and milk. Pour the egg mixture into the chocolate mixture, stirring to combine. In another bowl, sift together the flours, bicarbonate of soda and cocoa powder. Gradually add small quantities of the flour mixture to the chocolate mixture, making sure it is well incorporated before adding more. Add the sugar and stir until combined – the mixture should be fairly runny by this stage. 3. Divide your cake mixture evenly into the cupcake cases, filling each one about two-thirds full – to allow room for the cupcakes to rise. Bake the cupcakes for 15 minutes, or until the top of the cakes spring back slightly when gently pressed with a finger. 4. Remove the cakes from the oven and leave to cool on a wire rack, then remove the cupcakes from the paper cases. 5. To make the sugar syrup, put the sugar and 100ml/3½fl oz/scant ½ cup water in a saucepan and bring to the boil, without stirring. Leave to cool. 6. To make the buttercream, sift the icing sugar into a mixing bowl. Add the butter and beat for 5 minutes until pale, light and fluffy. 7. Using the serrated knife, carefully trim off the domed tops of each cupcake to create a flat stable base for the ghost cakes. Reserve the domed tops and leave to one side until needed. Turn the cupcakes upside down and attach a cake card to the base of each one with a little buttercream. 8. Lightly brush the top and side of each cupcake with a little sugar syrup. Using the offset palette knife, spread a thin layer of buttercream, followed by a layer of jam, over the top of each cupcake, then place the reserved domes on top, trimming as necessary to create a neat dome shape. Clean the offset palette knife, then use it to cover each cake with the remaining buttercream. Chill in the fridge for 2 hours until set. 9. Dust the work surface with a little icing sugar, then knead half of the white sugar paste until it is soft and pliable. Roll out the kneaded sugar paste quite thinly and stamp out 6 circles with the 12.5cm/5in circle cutter. Carefully lift an icing circle and gently place it over one of the cakes, taking care not to stretch or pull it. Use your hands to smooth it over the top and side, making sure to smooth out any air bubbles. Trim off any excess sugar paste at the base of the cake with the sharp knife. Use the scriber to prick out any remaining air bubbles in the sugar paste. 10. Dust the work surface with a little more icing sugar, then knead the remaining white sugar paste until it is soft and pliable. Roll out the kneaded sugar paste until it is 5mm/¼in thick, using marzipan spacers if you like, and stamp out 6 more circles with the 12.5cm/5in circle cutter. Roll over each circle with a small rolling pin to make the sugar paste slightly thinner. Brush the top of each cake with a little edible glue, then carefully lift a circle of sugar paste over the top of each one, pinching it into fabric-like folds at the base. Roll the trimmings into a ball and store in an airtight container so the sugar paste does not dry out and crack. of white sugar paste and attach them to the eyes with a little edible glue, flattening them slightly as you do so. To make the mouths, roll 6 pea-sized balls of black sugar paste into small sausages, then mould and flatten each one into a different shape, trimming the sugar paste with a small sharp knife if necessary. Attach the eyes and mouths to the ghost cakes with a little edible glue. Leave the cakes for at least 2 hours, uncovered, in a cool, dry place to allow the icing to set. Decorating is the new baking! Move over sponge cakes and shortbread: here come Sugared Rose Petal Cupcakes, Chocolate Heart Cake Pops, Filigree Glitter Biscuits, and many more delights – all easy to do, even if you’re new to baking. From Laura Lamont’s The New Low-Carb Cookbook. 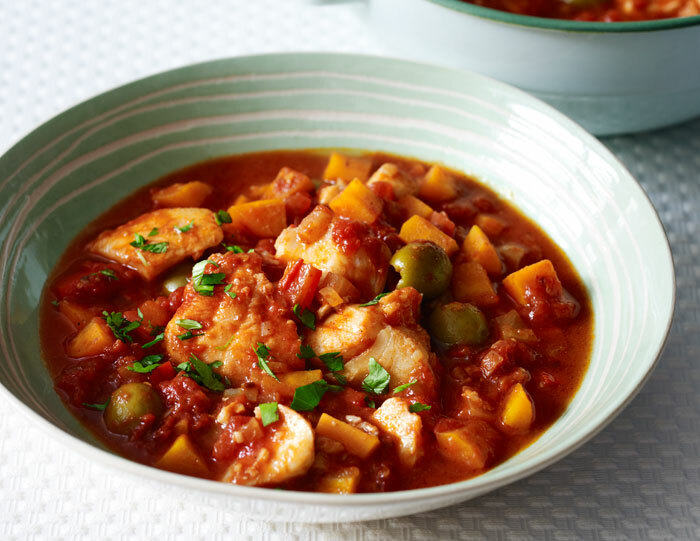 This wonderfully exotic but low-carb dish will really warm you through and get your circulation moving – and it’s quick to make so you’ll have a hearty mid-week meal in no time. The tender fish, flavoured with delicate spices, is sure to become one that the whole family will enjoy. 1. Put the oil, onion, carrot, red pepper, garlic, cumin, crushed chilli flakes, cinnamon and cayenne in a large, heavy-based saucepan over a medium heat, season to taste with pepper and cook for about 5 minutes, stirring regularly. Add the stock, tomatoes, tomato purée, lemon juice and olives and bring to the boil. Turn down the heat to low and leave to simmer, uncovered, for 10 minutes. 2. Add the stevia powder, paprika and cod and cook for a further 5–10 minutes until the fish flakes easily and the sauce is well blended. Serve the cod sprinkled with the chopped coriander. If you’re looking for a new approach to healthy eating and weight loss, nutritional therapist Laura Lamont’s The New Low-Carb Diet is the effective long-term answer. From Zita West’s Eat Yourself Pregnant, with recipes by Christine Bailey. It’s National Infertility Awareness Week, so who better to go to for advice than the UK’s most-trusted fertility expert Zita West. 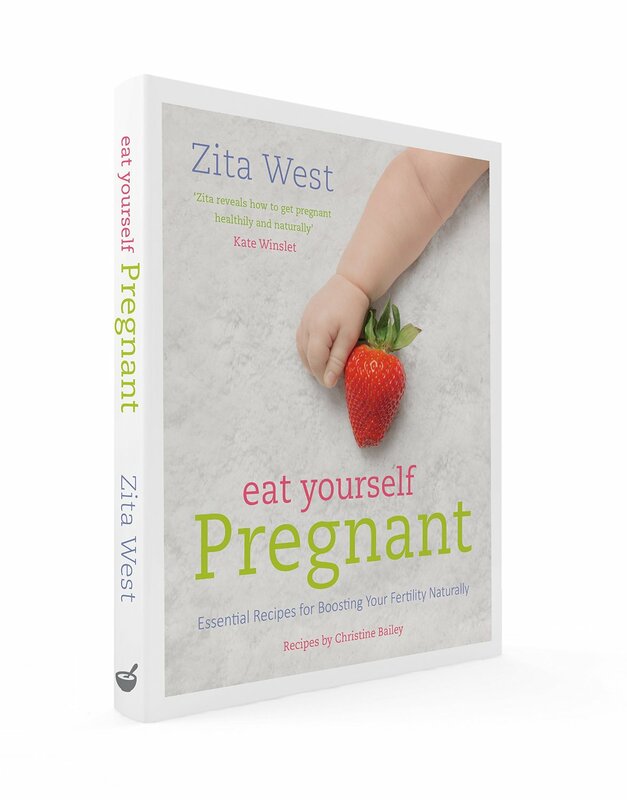 Zita knows that diet and fertility are inextricably linked, and so preparing your body for a successful conception really can come down to making the right food choices. This extract from her brilliant new book, Eat Yourself Pregnant, sets out some basic rules to follow to boost your chances of a successful conception through nutrition – and there is also a recipe for delicious Indonesian Chicken with Buckwheat Noodles to set you on the path to a baby-ready body. The latest national diet and nutrition surveys in the UK and USA reveal a worrying trend. They show that we have insufficient intake of key nutrients such as vitamin D, folic acid, iron, magnesium and omega-3 fats, and that we increasingly rely upon processed convenience foods rather than on fresh, whole foods. Furthermore, even if we do eat a healthy diet, modern methods of production and storage mean that the nutrient content of our food is often lower than the levels of 50 years ago. To make matters worse, stress and environmental toxins further deplete the nutrients in our bodies. For optimal fertility, we need to redress the balance. It’s not only your hormones and the neurotransmitters in your brain that need protein – eggs and sperm need it, too. High-quality protein, such as from lean meat and poultry, as well as fish, eggs and soya beans, contains all eight essential amino acids. These are biological catalysts that enable protein to break down and become what the body needs – be that muscle or other tissue, egg, sperm, neurotransmitter or hormone. Your body can’t manufacture these amino acids for itself (which is why they are essential), so they must come from your diet. Include one portion (about the size of your fist) of protein in every meal. If you’re vegetarian or vegan, you’ll need a full range of plant proteins to ensure that you get all the essential amino acids. Women tend to need more fat than men for the healthy production of hormones. Healthy fats, such as those found in oily fish and certain seeds, stimulate the action of beneficial prostaglandins within the body. These are fat cells that play a critical role in menstruation, conception, pregnancy and labour. Unhealthy fats, such as saturated fats and trans fats, are quite simply villains who hamper fertility! Healthy fats that your body can’t produce for itself, EFAs must come from your diet. There are several kinds, but the most important for fertility and conception are omega-3 fats. Not only are these crucial for hormone production, they also help to modulate the immune system, reduce inflammation and boost mood. Omega-3 fats help to balance compounds in the body known as eicosanoids, which may be linked to increased risk of miscarriage. Studies of pregnant women who consume large amounts of long-chain omega-3 fatty acids, such as EPA (eicosapentaenoic acid) and DHA (docosahexaenoic acid), both of which are found in fish oil, tend to carry their babies for longer and have a correspondingly lower rate of premature birth. This healthy type of fat can have a beneficial effect on insulin levels, helping to stabilize blood sugar, which has positive effects for your fertility. Monounsaturated fats remain liquid at room temperature, so are found in healthy oils, such as olive oil and sesame oil, and in nuts and seeds. Typically found in animal and dairy products, saturated fats, when eaten to excess, can interfere with your cell membranes (including those involved in reproduction). Furthermore, they may directly affect a man’s fertility by reducing the quality and quantity of his sperm. Saturated fats that contain medium-chain triglycerides (MCTs) – such as coconut oil – are more stable than other types of saturated fat, making them comparatively more healthy. These are more readily broken down by the liver and your body can use them for energy production. Found in processed or fried foods and some margarines, trans fats (also known as damaged, hydrogenated or partially hydrogenated fats) prevent your body from making good use of essential fats and are generally harmful for all aspects of health, including fertility. All processed oils contain trans fats and they regularly appear in foods marketed as low fat. How much and what kind? Fats should comprise around 30 per cent of your diet, but no more than 10 per cent should come from saturated fats, and you should avoid trans fats altogether. The fats in your fertility diet should come from foods rich in EFAs and monounsaturated fats. This works out at a maximum intake of approximately 70g (2½oz) of fat per day for women and 95g (3¼oz) per day for men. As a guide to what this means in practice, one avocado contains almost 30g (1oz) of fat, a tablespoon of olive oil contains 14g (½oz) fat. Monounsaturated fats include olive oil, rapeseed oil and rice bran oil, as well as the natural oils in avocados, most nuts and seeds, and organic, free-range poultry. Omega-3-rich foods include oily fish (such as mackerel, salmon and sardines), rapeseed oil, linseeds (flaxseeds), chia, hemp and pumpkin seeds, and walnuts. Another type of essential fat, omega-6, occurs in raw seeds, especially chia, hemp, pumpkin, sesame and sunflower seeds, and their oils. Your body needs carbohydrate for energy, but the quality of those carbs is critical. Good carbs are known as complex. These are slowly broken down into glucose (which the body uses as fuel), and are steadily released into the blood stream. You may hear them referred to as low-glycaemic-load (GL) carbohydrates. Because low-GL carbs are more nutritionally dense than other kinds, they help to keep your blood-sugar levels stable. Beans, pulses, vegetables, whole grains and some fruits, such as berries and citrus fruits, are all good sources. And if you combine good protein, good fats and good carbohydrates at each meal, you’ll be doing the best you can to balance your blood sugar. Eliminate refined sugars, sodas, processed fruit juices and artificial sweeteners – as these are all sources of bad carbohydrate that release sugar into the blood stream too quickly, causing insulin imbalance. During metabolism, your body produces free radicals – unstable molecules that race through you trying to make themselves more stable. In doing this, they damage otherwise healthy cells. Toxins, pollution and a poor lifestyle (including smoking and getting sunburnt) can also cause free-radical damage (also known as oxidative stress) within the body. Male infertility, endometriosis and damage to egg cells and to sperm have all been linked with the action of free radicals. Wonderfully, there are brave warriors against free-radical damage – antioxidants. There are two types of antioxidant – endogenous antioxidants that are made by the body, and exogenous that you obtain from your diet and supplements. Fruit and vegetables are packed with powerful phytonutrients (plant nutrients) that are potent antioxidants. Think colour – the darker or brighter the colour of the fruit or vegetable, the greater its antioxidant power. Nuts and seeds, herbs, spices (particularly turmeric) and green tea are also good sources. tailor your diet to take into account the ebb and flow of your cycle, so that you can eat more healthily when your hormones allow, and leave yourself a little bit of leeway for the times when nothing but chocolate will do. Overall, I recommended an 80:20 approach – try to stick to my recommendations 80 per cent of the time and don’t worry if you occasionally slip up (that is, you have a 20-per cent leeway). To give you a clean-slate position from which to start preparing for pregnancy, before you embark upon applying the principles of the baby-ready diet, it’s important you try a detox (intended for both of you) that will help get your body back to basics. The body’s natural detoxing organ is the liver, and the aim of a detox programme is to reduce the burden on it, which will help balance your oestrogen levels and help you to kick any bad habits. Having prepared with your detox, there are certain general principles that I want to encourage you to adopt in your diet over the coming months. These are to get your gut healthy and your blood sugar in balance, and to create a less acidic environment in your body, which is not only better for you generally, but a better environment for sperm. As you’ve seen, your hormones are made by the nutrients in your system. This means that your gut needs to be in super condition to get the best out of your food. Here are my top tips for gut health. The Chinese believe that foods have five flavours – sweet, sour, salty, bitter and fragrant. All are thought to create different energies in the body, which affect the flow of qi (the body’s life force). In order to be healthy, the Chinese believe we need a balance of all these flavours in our diet. Whether or not you hold with the Chinese view, the notion of balance is one that is crucially important for good gut health. Try to implement the 80:20 approach to eating and make sure you get a range of nutrients. Your digestion is raring to go at breakfast. This is why having a good breakfast that includes slow-releasing carbohydrates is essential at the start of the day. Breakfast is the most important time to set yourself up to avoid snacking. I’m not a great one for snacks – I think that if you eat good carbs, you shouldn’t feel the need to snack between mealtimes. Take your main meal at lunchtime twice or three times a week if you can. This avoids a heavy meal in the evening, which may interfere with your digestion. (Focus more on protein and vegetables – and less on carbs – in your evening meals, as these are less taxing for your gut. Carbs, raw foods and alcohol after 7pm can result in a combination of sugars that ferment in your gut, causing gas and acidity that weaken your gut lining.) Also, a late supper means that you’re taking in a lot of fuel, but not doing anything with it, so it is stored as fat. Finally, but importantly, if your body is busy trying to digest food at night, you won’t be able to sleep properly. Increasingly, the Western population in particular is overeating. As a guide, don’t eat until you can’t take any more – stop before you get full. Use a smaller plate so that what’s on it looks lavish rather than mean; and savour every mouthful to fully appreciate what you’re eating. As a child weren’t you always told to chew properly? Chewing is the first stage of the digestion process, increasing the salivary enzymes that help to break down your food before it gets to your stomach, making it easier to digest. By chewing your food you also feel fuller for longer and so are less likely to snack or overeat. • Combine protein and carbohydrate at every meal. This delays the digestive process and allows a more gradual release of glucose into your blood stream. You will feel fuller for longer and are less likely to have an energy dip that makes you want to snack on something sweet. Peas and beans are a ready-made mixture of protein and carbohydrate, so stock up on them. • Avoid refined carbohydrates and processed foods – including sugary cakes, biscuits and sweets, juice drinks or squashes, white bread and white rice and pasta. These are bad carbohydrates that release sugar too quickly into your blood stream and put you back on that rollercoaster of energy highs and lows. • Eat slow-releasing low-GL carbohydrates – brown, dense and grainy foods that have all the vitamins, minerals and fibre still retained. • Add a little unsaturated fat to your meals – almonds, avocado, olives, peanuts, pine nuts and sunflower seeds, and cold-pressed organic olive oil are all good sources. • Always read the label. If sugar is one of the first ingredients listed (even if it’s as organic cane juice, honey, agave, maple syrup, molasses or fructose syrup), put the product back. • Snack between meals only if you are really hungry. If you must have something, make sure it’s the right kind of snack. Nuts and seeds; oat cakes with hummus, cottage cheese, guacamole or nut butter; or fresh fruit with a spoonful of live yogurt are all examples of good-for-you snacks. Sperm thrive in a slightly alkaline environment. This is why vaginal secretions during a woman’s fertile time are slightly alkaline. The pH of your blood is around 7.35–7.45, which is also slightly alkaline. Keeping your diet more alkaline is easier on your digestive system and will help your body maintain its natural acid–alkaline balance. Although the body prefers to be slightly alkaline, acidity is a normal by-product of your metabolism. Acids are created when your body converts fats, proteins and carbohydrates into energy; then, they are excreted as waste. High-protein diets, high alcohol intake and eating processed foods, as well as stress and smoking, all make the body more acidic. In order to maintain acid–alkaline balance, 80 per cent of your food intake should be alkaline – which means eating plenty of alkaline-rich vegetables and some fruit with each meal. Use the following lists as a guide to the acidic (or otherwise) nature of certain foods. Try not to become too fixated on them, though – just be aware. As long as your diet is varied and healthy, your body should sort out the rest. A hearty meal in a bowl, lightly spiced and packed with nutrient-rich vegetables. 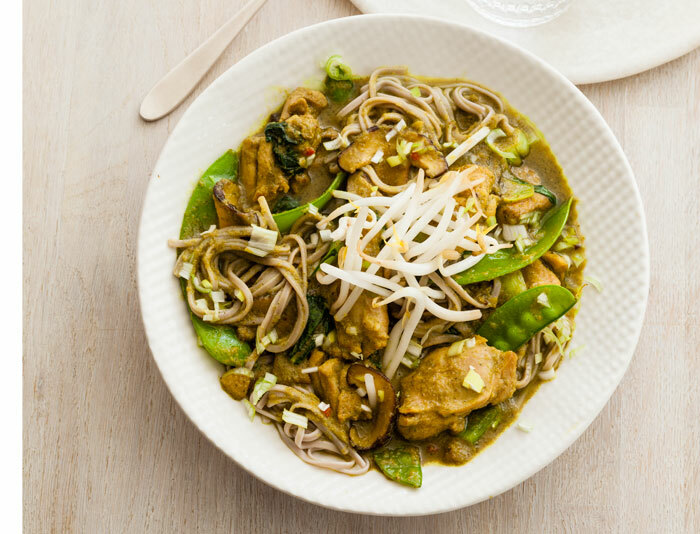 This dish contains a wealth of anti-inflammatory ingredients, including ginger, garlic and turmeric, together with immune-supporting shiitake mushrooms and coconut. Buckwheat noodles, also called soba, are a nutritious staple in Asian dishes and provide plenty of slow-release carbohydrates to keep you energized throughout the day. 1. Put the lemongrass, coriander, onion, garlic, ginger, coconut sugar, soy sauce, fish sauce, turmeric, garam masala and coconut milk in a blender or food processor and process until smooth. Pour over the chicken pieces and season lightly with salt and pepper. Cover and leave to marinate in the fridge for at least 2 hours, or overnight. 2. Cook the buckwheat noodles with the sesame oil according to the packet instructions, then drain and refresh under cold water. 3. Meanwhile, heat the coconut oil in a wok or large frying pan. Drain the chicken, reserving the marinade, and stir-fry for 2–3 minutes. Add the chilli, pak choi, mangetout and mushrooms and cook for a further 1 minute. Add the reserved marinade and simmer for 10–15 minutes until the chicken is cooked through. Toss in the noodles and warm through. Sprinkle over the bean sprouts and spring onions and serve. Fertility and nutrition are inextricably linked, and equipping your body with the essential nutrients will increase your chances of conceiving naturally. Zita West, the UK’s most trusted fertility expert, explains how the chemistry of babymaking works and offers indispensible advice on how to prepare your body for a successful pregnancy. Also included are 65 inspiring and mouthwatering recipes that ensure that you are including all the vital nutrients for conception in your diet. £14.99 | Buy the book now! 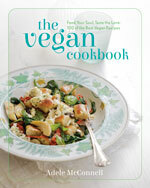 From Penny Brohn’s Cancer Care cookbook Nourish, with recipes by Christine Bailey. This month is Breast Cancer Awareness month, so we’re sharing two cancer-fighting smoothie recipes – to give you a huge antioxidant boost – from Nourish: The Cancer Care Cookbook, written in partnership with Penny Brohn Cancer Care. A light and refreshing shake, juice or smoothie contains beneficial ingredients in a form that is easy to take, making it useful for breakfast or as a snack, particularly if you find your appetite is low or you’re just too tired to cook a meal. Matcha is an antioxidant-rich powdered Japanese green tea. The whole leaves are used, making matcha more potent than brewed green tea and higher in antioxidants. 1. Put the almonds in a blender or food processor with 500ml/17fl oz/2 cups water and process until smooth. Strain through a fine sieve, if you prefer. 2. Add the mango and the matcha, and process again until thick and creamy. 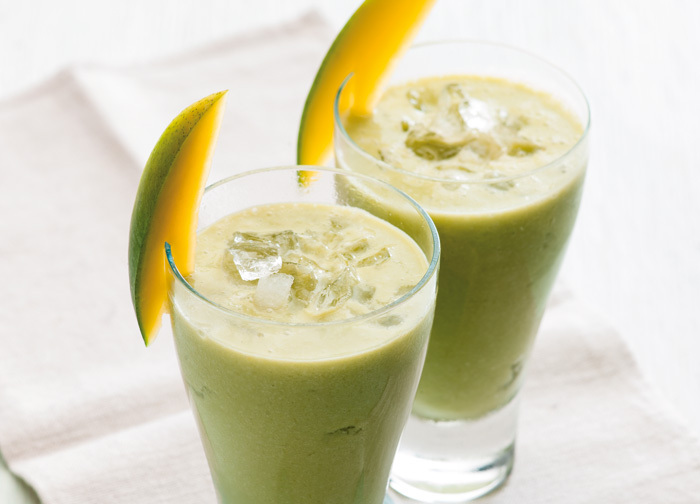 Drink immediately, served with ice and mango, if you like, or store in the fridge for up to 2 days. Including hemp protein powder in your smoothies is an easy and healthy way to increase your intake of quality protein and omega-3 and -6 essential fats. It also helps to stabilize blood sugar levels. 1. Put all the ingredients into a blender or food processor and process until smooth. Drink immediately or store in the fridge for up to 1 day. Looking for more recipes to help you through cancer treatment? Try this Wilted Kale Salad for a super-food boost of glucosinolates or help your immune system with protein, antioxidants, selenium and zinc, all locked in these delicious Japanese Lamb Burgers. 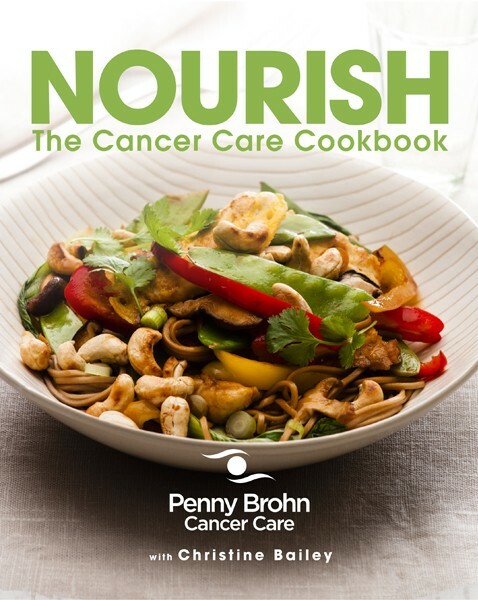 Nourish: The Cancer Care Cookbook embraces the holistic healthy living approach of Penny Brohn Cancer Care, combining nutritional advice with 7-day menu plans and healthy recipes design to help you, or someone you know, live with cancer. From Sunil Vijayakar’s The Big Book of Curries. 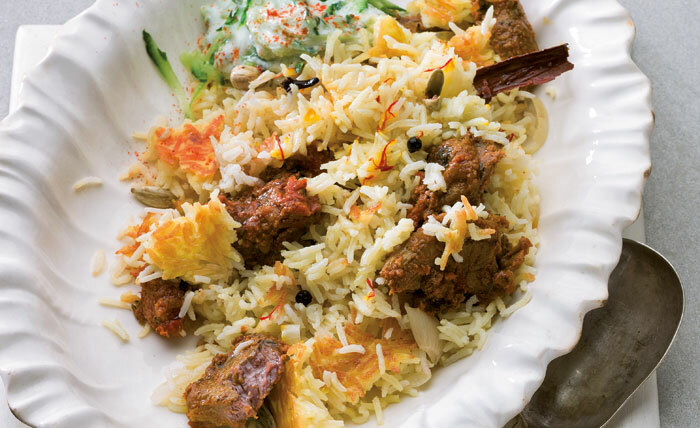 Celebrate Diwali with this delicious and fragrant Lamb Biryani. Serve with crisp poppadoms and creamy raita for a feast of flavours and textures. 1. Put the lamb in a glass or ceramic dish. Mix together the garlic, ginger, yogurt and coriander leaves and rub this mixture into the lamb. Cover and leave to marinate in the refrigerator for 4–6 hours. 2. Heat the oil in a heavy pan over a medium heat. Add the onion and fry, stirring occasionally, for 12–15 minutes until lightly golden. Add the lamb and cook over a high heat, stirring frequently, for 15 minutes until well browned. Stir in the ground coriander, cumin, chilli powder, turmeric and tomatoes and season well with salt and pepper. Bring to the boil, then reduce the heat to low and simmer for 30 minutes or until the lamb is tender and most of the liquid has been absorbed. 3. Meanwhile, make the rice. Heat the oil in a heavy lidded pan over a medium heat. Add the onion, cumin seeds, cloves, peppercorns, cardamom and cinnamon and cook, stirring, for 6–8 minutes until lightly browned. Add the rice and cook, stirring, for a further 2 minutes until well coated. Add 400ml/14fl oz/scant 1&frac23; cups water and bring to the boil. Cover tightly, reduce the heat to low and simmer for 6–7 minutes. Remove from the heat and keep covered. In a small bowl, mix together the saffron and warm milk and set aside to infuse. 4. 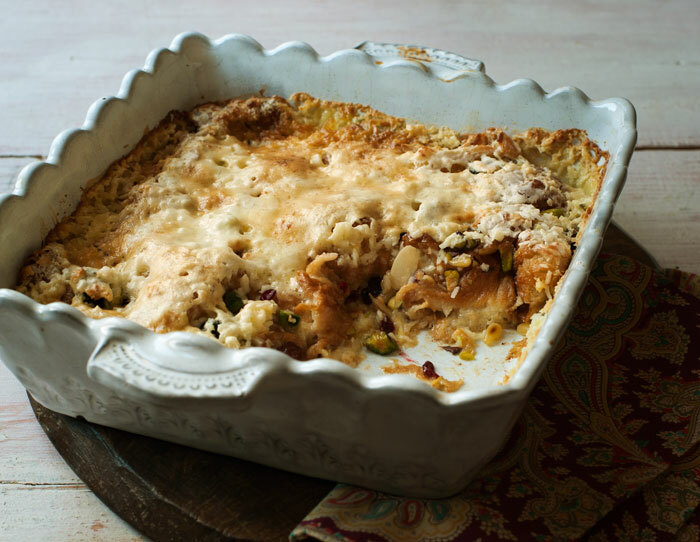 Preheat the oven to 180°C/350°F/Gas 4 and lightly butter a medium casserole dish with a tight-fitting lid. Spread a thin layer of the meat mixture over the bottom and cover evenly with half of the rice. Drizzle over half of the saffron mixture, then layer again. Cover the dish with foil, then with the lid, and bake for 30 minutes. Remove from the oven and leave to rest, covered, for 30 minutes before serving with poppadoms and raita. 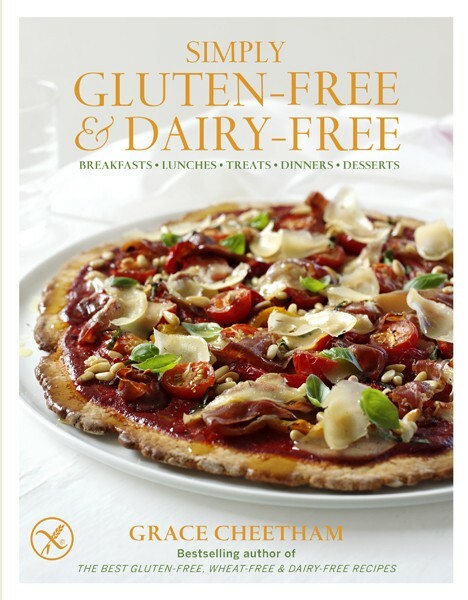 From Grace Cheetham’s Simply Gluten-Free and Dairy-Free. Being gluten intolerant or having a dairy allergy (or like Grace, both) doesn’t have to mean missing out on delicious baked treats. 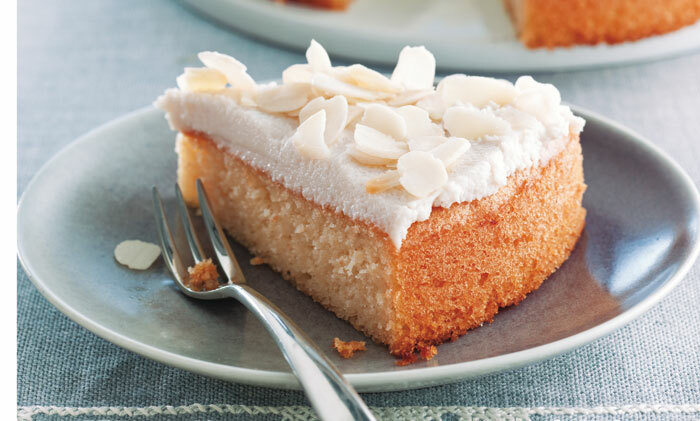 Grace has spent years experimenting with the growing range of free-from products, and has developed a wealth of delicious recipes, such as this wonderful almond cake. Thanks to the ground almonds, it comes out of the oven light, fluffy and moist. The flavours are delicate, and the almond cream and flaked almonds add a rich coating with a crunchy top. 1. To make the almond cream, put the blanched almonds in a bowl, cover with water and leave to soak overnight or for at least 12 hours, then drain, rinse well and transfer to a blender. Add 150ml/5fl oz/scant &frac23; cup water and blend for 10 minutes until smooth. Pour the mixture into a saucepan and add the sugar, almond extract and agar agar flakes. Heat over a low heat for 3–4 minutes until the sugar and agar agar flakes have dissolved completely, stirring continuously to make sure the mixture doesn’t burn. Transfer to a heatproof bowl, leave to cool, then cover and chill in the fridge until needed. 2. Preheat the oven to 180°C/350°F/gas 4 and lightly grease a 20cm/8in cake tin with dairy-free margarine and line the base with baking parchment. Using an electric mixer, beat the dairy-free margarine and sugar together in a large mixing bowl until light and fluffy. Beat in the almond extract and gradually beat in the eggs, a little at a time, until well mixed. Add the ground almonds, gluten-free baking powder and xanthan gum to the mixture, then quickly fold in, using a spoon. Mix well, but take care not to overmix, then pour into the tin. 3. Bake for 20–25 minutes until golden brown, well risen and a skewer inserted in the centre comes out clean. Remove from the oven and leave to cool for 5 minutes. Turn out of the tin, transfer to a wire rack and leave to cool completely. 4. Spread the almond cream over the cake, sprinkle with the flaked almonds and serve. Keep any leftover cake in the fridge. Simply Gluten-Free and Dairy-Free by Grace Cheetham. Order now with free UK postage! From Renée Elliott’s Me, You and the Kids Too. Renée Elliott, founder of Planet Organic, understands how important it is to feed your family well on natural, unprocessed foods that are produced with respect for the environment. See her talking to the Telegraph newspaper about her personal values – for raising a family and in business – in this heart-felt video. Renée is also the author of Me, You and the Kids Too, a brilliant cookbook that shows you how family cooking can be made simple – and how it’s possible to please everyone at the table, however small they may be! Each recipe includes two simple variations, so that you can turn a family dish for adults and older children into delicious, nutritious baby purées for weaning little ones with very little extra effort. Included here is her recipe for a delicious Roasted Vegetable Lasagne. 1. Preheat the oven to 250°C/500°F/gas 9 and grease one baking dish and one large baking dish with oil. Put the tomatoes in the baking dish and drizzle 3 tablespoons of the oil over the top. Sprinkle with the parsley, oregano and thyme and toss gently but thoroughly. Put the artichokes, pepper, onions and courgette in the large baking dish, drizzle with 5 tablespoons of the oil and toss gently. Put both baking dishes in the oven and bake for 30 minutes until the vegetables are soft and beginning to brown. Remove from the oven then set aside to cool. 2. Turn the oven down to 200°C/400°F/gas 6. Transfer the roasted vegetables to a large bowl, add the salt and toss well. 3. Drizzle the remaining oil over the bottom of the large baking dish, then spread &frac13; of the roasted tomatoes evenly over the bottom, followed by 3 lasagne sheets, ¼ of the mozzarella, &frac13; of the roasted vegetable mixture, &frac13; of the capers, ¼ of the olives and &frac13; of the garlic. 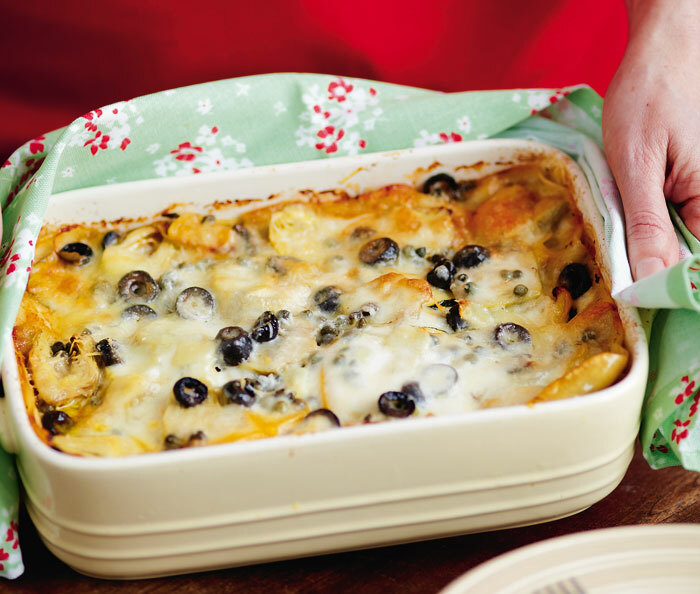 Repeat the layers twice, then sprinkle the Parmesan and the remaining mozzarella and olives evenly over the top. 4. Bake for 40 minutes until the top is bubbling and golden brown. Serve hot with avocado salad. 6–9 months: Artichoke, Courgette & Avocado Purée Put 3 tablespoons of the roasted artichokes, 2 tablespoons of the roasted courgette, 2 tablespoons of avocado and 3 tablespoons water in a blender. Blend for 30 seconds, adding extra water 1 teaspoon at a time, until smooth. Serve warm. 9–12 months: Roasted Artichoke, Courgette, Onion & Avocado Put 2 tablespoons each of the roasted artichokes, courgette, onions and avocado and 3 tablespoons water in a blender. Pulse for 15 seconds, adding extra water 1 teaspoon at a time, until the mixture forms a lumpy purée. Serve warm. Cooking for a family can be a huge challenge that leaves you feeling like you’re always making compromises. 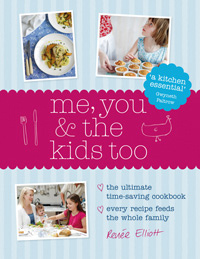 In Me, You and the Kids Too, Renée Elliott makes this do-able. 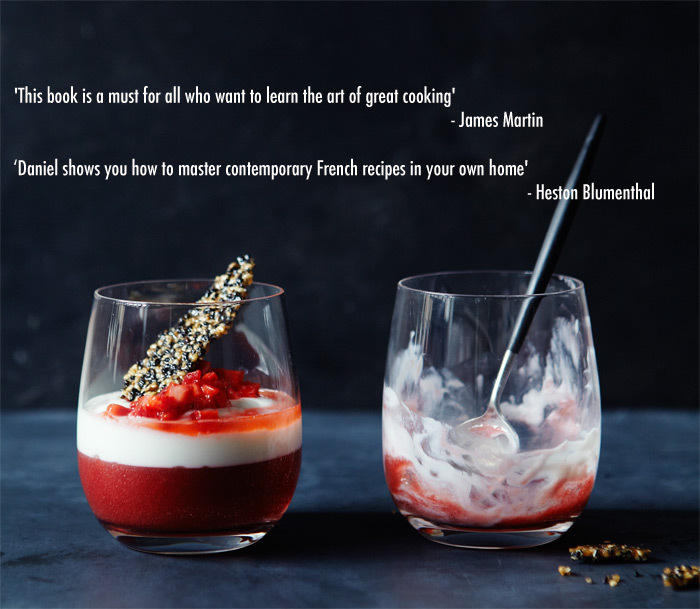 She shows that you don’t have to cook different recipes to please everyone at the table – and that you never have to sacrifice flavour or nutrition to get meals made without stress. From Daniel Galmiche’s Revolutionary French Cooking. 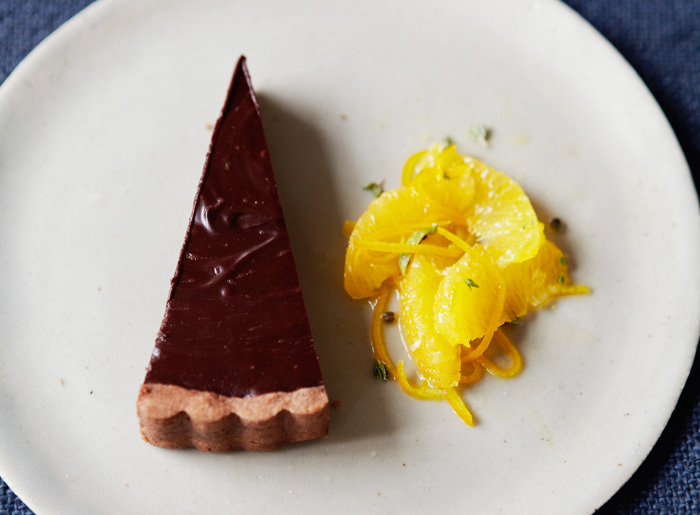 If any of you chocaholics are using ‘National Chocolate Week’ as an excuse to indulge this week, there’s not many better ways to do it than with this superb tart. Infused with lemongrass and chilli and made with the finest cocoa, it has a rich texture, a silky silhouette and lovely crisp pastry, which is a combination bound to make you happy. 1. To make the sweet pastry, sift the flour and cocoa powder into a bowl. In a separate bowl, beat together the butter, sugar, salt and egg yolk until light and fluffy. Sift in the flour mixture, then fold it through gently until it just begins to form a dough, then stop! You don’t want to work this pastry at all. Wrap in cling film and put in the fridge for 20 minutes. 2. Grease an 18cm/7in non-stick, loose-bottomed flan tin with a little butter, if necessary. Roll out the pastry between two sheets of baking paper until 3mm/&frac18;in thick, then roll the pastry over the rolling pin and lift it over the flan tin. With one hand, lift the pastry edge and with the other, gently tuck the pastry into the bottom and sides of the tin so that it fits tightly. Don’t overstretch it or it will break, and press down gently to push out any bubbles. Trim off any excess pastry by rolling the pin over the top edge of the tin. Prick the base with a fork and chill for 25–30 minutes to prevent the pastry shrinking during baking. 3. Meanwhile to make the filling, put the cream in a saucepan over a medium heat and bring just to a simmer. Remove from the heat, add the lemongrass and chilli, cover with cling film and leave in a warm place to infuse for 30 minutes. 4. Towards the end of the chilling/infusing time, preheat the oven to 180°C/350°F/gas 4. Line the pastry case with baking paper and cover with baking beans. Bake for 6 minutes, then remove the paper and baking beans, turn the oven down to 160°C/315°F/gas 2½ and bake for a further 3–4 minutes until the pastry is cooked through and light brown. 5. Put the chocolate and butter in a heatproof bowl and rest it over a saucepan of gently simmering water, making sure the bottom of the bowl does not touch the water. Heat, stirring, until the chocolate has melted. Remove the cling film from the cream and strain to discard the lemongrass and chillies. Pour the cream slowly into the chocolate mix, whisking all the time until you have a soft, shiny, chocolate ribbon. Pour it into the pastry case and leave to one side in a cool place for 1½ hours until just set. Do not put it in the fridge as this will take the shine off the chocolate. Serve sliced with the orange salad. From Adele McConnell’s The Vegan Cookbook. 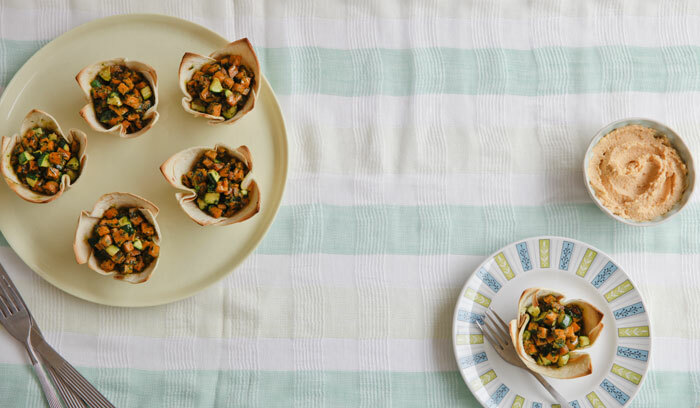 For a fantastic twist on a lunch wrap, try these gorgeous little tortilla cups, filled with delicious roasted sweet potato and a zesty fresh pesto. They are completely vegan, but whether you follow a plant-based diet or not, we guarantee you’ll love them as much as we do. 1. Preheat the oven to 200°C/400°F/Gas 6. Put the sweet potato in a bowl and add the oil. Mix well to coat thoroughly and tip on to a baking tray. Roast for 30 minutes, then add the courgette to the tray. Roast for a further 15 minutes, or until tender. 2. While the vegetables are cooking, cut each tortilla into quarters and, using a small amount of oil, grease six muffin cups. Press 1 piece of tortilla inside a muffin cup and smooth into the edges to line the cup, then add a second piece at an angle and smooth in the same way. Leave the edges overhanging, to create a tortilla ‘cup’. Leave to one side. 3. Put the basil into a blender or food processor and add the parsley and spinach leaves, then process until they are well combined. Add the walnuts, olive oil, garlic and lemon juice. Season with salt and pepper, and blend into a smooth paste to make a pesto. 4. When the sweet potato is cooked, leave the baking tray on one side to cool. When the vegetables are cool, tip them into a large mixing bowl, and combine with 2 tablespoons of walnut pesto. Spoon the sweet potato and courgette mixture into each tortilla cup and bake for 15 minutes, or until the tortillas are golden brown. Top with a large spoonful of hummus and serve with the remaining pesto. The pesto can be stored in a sterilized jar in the fridge for up to 1 week or frozen for up to 1 month. From John Gregory-Smith’s Mighty Spice Cookbook. It’s London Cocktail Week, so to get you in the mood, have this wonderful rum concoction on us! 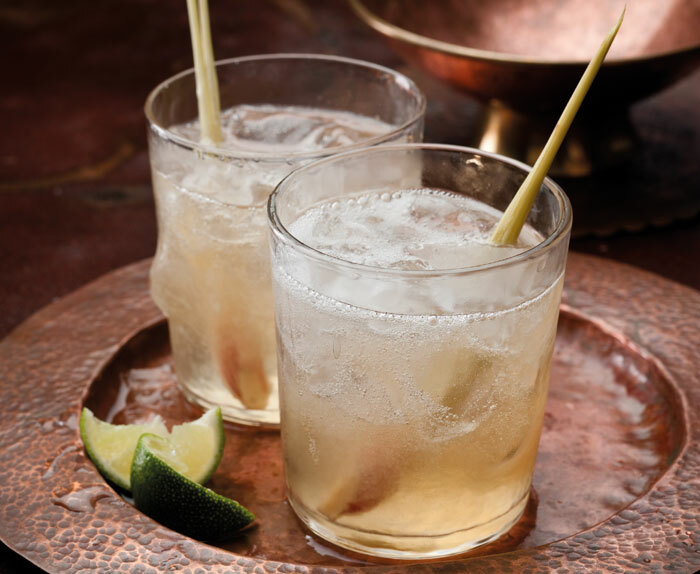 From John Gregory-Smith’s Mighty Spice Cookbook, it fuses mellow rum with the zing of fresh ginger and aromatic lemongrass, all topped up with tonic for a seriously sophisticated and perfectly refreshing drink. Chin-chin! 1. Cut off the ends of the lemongrass stalks and bash the fatter ends of the lemongrass a couple of times with a heavy spoon to help release their delicious flavour. Put the lemongrass in a saucepan with the sugar and 185ml/6fl oz/¾ cup water and bring to the boil. Turn the heat down to low and simmer, shaking the pan occasionally, for 4–5 minutes, or until all the sugar has dissolved. Remove from the heat and set aside to cool. You will end up with more sugar syrup than you need for four drinks, but it’s important to cover the lemongrass stalks with enough water so you get the maximum flavour from them. The extra syrup will keep for a few days in the refrigerator. 2. Grate the ginger into a cocktail shaker, discarding any fibrous bits. Pour in the rum, juice from 1 of the limes, 55ml/1¾fl oz/scant ¼ cup of the cooled lemongrass sugar syrup, then add the lemongrass stalks from the syrup and a handful of ice. Shake vigorously until the ingredients are well combined. 3. Divide the cocktail into four ice-filled rocks glasses, top up each glass with tonic water and serve with a lemongrass stalk from the shaker to use as a stirrer. 4. Squeeze the juice from the remaining lime into the four glasses and stir in with the lemongrass stalks. Serve immediately. 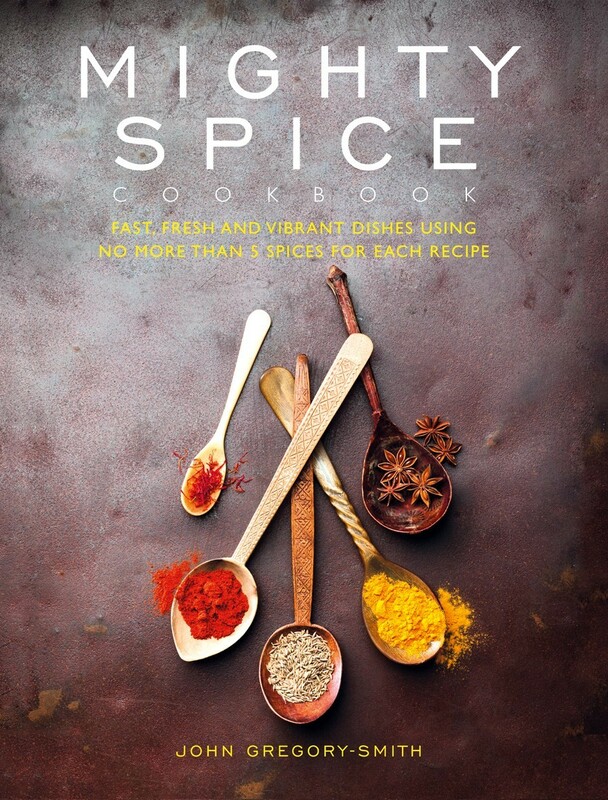 Spicing up your bookshelf, Mighty Spice Cookbook will take you on a culinary journey across the globe – with 100 inspiring recipes from the Far East, North Africa and Central America. 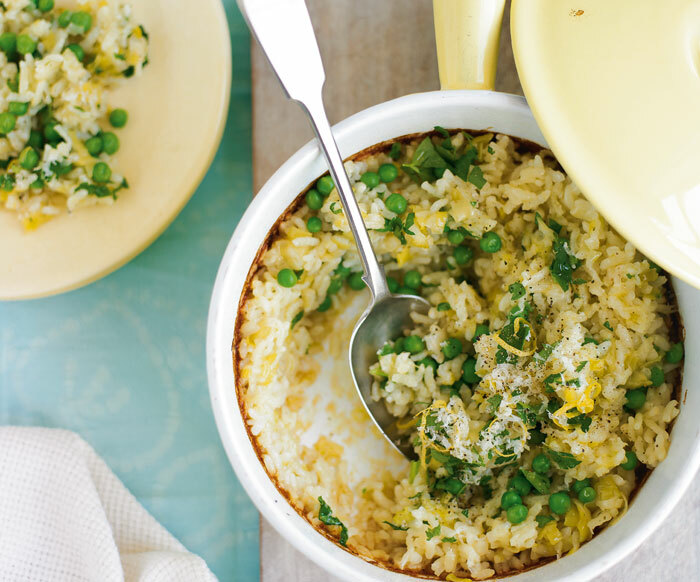 This dish makes a brilliant substitute for risotto. The flavours are absolutely wonderful and you don’t need to stand over the hob – just pop the whole lot in the oven and leave to cook while you relax. Peas, which are often a favourite with children because they are a great finger food, are sweet and packed with nutrients like antioxidants. 1. Put the rice and yogurt in a large bowl and cover generously with warm water. Leave to soak, covered, for 7 hours or overnight at room temperature. Drain well. 2. Preheat the oven to 200°C/400°F/gas 6. Pour the oil into a large casserole dish and heat a large saucepan over a medium-high heat until hot. Add the soaked rice to the pan and cook, stirring continuously, for 5 minutes, or until dry. Transfer the rice to the casserole dish and stir well, making sure the rice is thoroughly coated in the oil. Mix in the leek and ¾ of the lemon zest, then pour in the stock and stir well. Bake for 35–40 minutes until the rice is soft but still has a slight bite and there is only a little stock left in the casserole dish. 3. Remove the casserole dish from the oven and stir in the peas, 3 tablespoons of the parsley, ¾ of the Parmesan and the lemon juice. Serve warm, sprinkled with the remaining lemon zest, parsley and Parmesan. From Bethany Kehdy’s The Jewelled Kitchen. What’s the one bright side to the grey weather that’s setting in? It’s time to legitimately crack out the comfort food! This dessert, known as Um Ali Bread Pudding, is named after the mother um Ali, and is full of wonderful, warming aromatic spices. The tales of both the mother and the dessert are many and intriguing. This dessert is a quick and easy way to win legions of hearts. It’s also a mouth-watering way to use up stale croissants – or a great reason to go and buy some! 1. Preheat the oven to 180˚C/350˚F/Gas 4 and line a baking sheet with parchment paper. 2. Tear up the croissants into bite-size pieces, place on the baking sheet and bake in the oven for 10 minutes until crisp and golden. 3. Spread the baked croissant pieces across the base of a baking dish, about 28cm/11¼in square. Sprinkle over the raisins, almonds, pine nuts and pistachios, making sure they are spread evenly. 4. Heat the milk in a heavy-based saucepan over a medium heat, add 3 tablespoons of the sugar and mix well to dissolve. Reduce the heat to low, add the cinnamon and orange blossom water and heat through at a gentle simmer for 3–4 minutes. Remove the pan from the heat and leave it to cool so that the egg will not scramble when it’s added to it. 5. Meanwhile, put the cream and the remaining sugar in a mixing bowl and whisk until the mixture forms soft peaks. Sprinkle in the coconut and gently fold to incorporate. 6. Add the egg to the cool milk mixture and whisk to combine. Ladle the mixture into the baking dish and spread the whipped cream over the top. 7. Bake in the oven for 15 minutes until everything is bubbling and the top is golden, if necessary placing it under a hot grill for the last 1–2 minutes to brown the top. Remove from the oven and leave to stand for a couple of minutes. Serve warm. 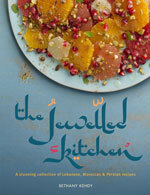 Bethany Kehdy is a pioneer of today’s new Middle Eastern cuisine.The Jewelled Kitchen takes you on an unforgettable adventure of Middle Eastern and North African cuisines. From Tuna Tartare with Chermoula and Sumac-Scented Chicken Parcels, to Cardamom-Scented Profiteroles and Ma’amoul Shortbread Cookies – mouth-watering dishes for you to try. Find Bethany at her inspiring food blog dirtykitchesecrets.com. £20.00 l Buy the book now!